It's not easy to describe Point Dume, the craggy elbow of land that cradles the northern tip of the Santa Monica Bay. With visitors, I start at the wild, untouched headland with its sheer cliffs, rocky coves and secret pocket beaches. I'll drive them through the residential flats where mega-mansions line the bluffs and modest ranch homes sit on wide grassy lawns. There's a tidy school, some cute shops, some hiking trails. And then there's the Dume Room. Tucked between a dry cleaners and a pizza joint, the Dume Room is the last gasp of blue-collar Malibu. It's where the waitresses and welders, construction workers and conmen come after a hard day's work; where local celebs like Pam Anderson, Nick Nolte and Emilio Estevez sometimes hang out. They say Steve McQueen drank here. John Wayne, too. It's a raunchy place, the Dume Room, rowdy and crowded and borderline dangerous in the best dive tradition. During the day you'll see big, bad, flea-bitten dogs snoozing near the front door, waiting for their owners to drink their fill. At night it's everything a hole-in-the-wall should be - dark and loud and unpredictable. There's an old wooden bar, a dozen comfy stools, a fancy fish tank built right into the wall. There's a pool table in back, stained by the years, and a juke box crammed with so much great music, you feel like it's reading your mind. The drinks are strong and the bartender's friendly, there's a live band on weekends and Karaoke on Thursdays. Talk to anyone and they'll talk back, buy you a beer, shoot a game of eight-ball. But next week, the Dume Room's off my tour. Thanks to a real estate deal that has the whole town talking, the best bar in the 'Bu is shutting down. After thirty-five years in the same spot, thirty-five years of channeling old-style, outlaw Malibu, it's over. Sold to a developer who's putting something spiffier, something more genteel in its place. Last call - the last last call - is Sunday. Two a.m. The Dume Room won't go quietly, that's for sure. 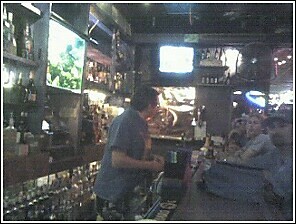 Ask the regulars if they'll be there and they look at you like you're nuts. Where else would they be? They've talked about buying the place, of moving it elsewhere, but they know it's just a dream. Instead they've settled for venting their rage and sorrow in black magic marker on the mirrors that line the walls. So now we call it the Doomed Room. Doomed, as in, here's the last place to remind you that millionaire Malibu was once a working class town, a historical haven for outlaws and bootleggers and smugglers and thieves. Doomed, as in once the four-star restaurants put away their wine lists at 9 or 10 p.m., there's nowhere else in town to get a beer. As inevitably doomed as Point Dume itself, the cliffs and coves and beaches, crumbling, bit by bit, vanishing.